Thank you to all of you who made donations to ARC in 2012. If you meant to make a contribution before the end of the year, but time got away from you, no worries. Make your donation to ARC now and feel good about starting the New Year off right! 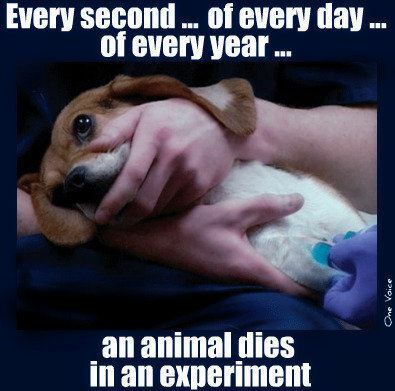 We made a significant dent in the culture of violence that is animal research by working to ban pound seizure in Minnesota (signed into law and banned in April 2012! 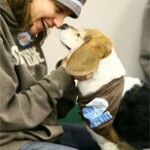 ), by exposing Marilyn Carroll’s primate addiction experiments at the U of M, and by bringing unwanted attention to the American Association for Laboratory Animal Science’s national convention with a demonstration attended by over 100 people. It was great seeing so many members and friends at ARC’s annual Holiday Open House on Saturday, December 8 at Ethique Nouveau. We enjoyed chatting with all of you about everything ARC has accomplished this year and our plans for an even bigger and better 2013. Many thanks to Kaylyn Knopp for the scrumptious vegan appetizers. We had lots of fun and cookies were flying at the annual vegan holiday cookie exchange on Saturday, December 15 at Ethique Nouveau. 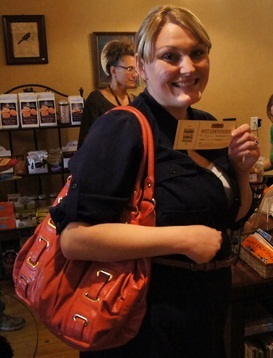 Everyone went home with 4 dozen vegan cookies to nosh or share with holiday guests. Recipes from the cookie exhange are posted at Minneapolis Vegan Meetup. Note that Ethique Nouveau will be open during the holidays on Sunday December 16 and December 23 from noon to 4:00pm in addition to the regular posted store hours. 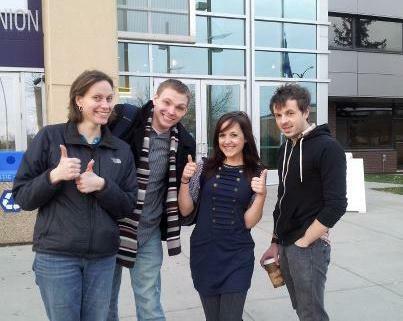 ARC volunteers Troy, Derek, and Jenna, along with ARC Program Director Dallas Rising traveled to Minnesota State University in Mankato on 11/27 to do Pay Per View outreach. They had 68 powerful conversations about animal liberation and plant-based eating in one day – a great success! Our Pay Per View program offers people one dollar to view a short video on practices in the animal agriculture industry, which includes footage taken in slaughterhouses and on farms. Then our trained volunteers have debrief conversations with viewers and provide them with info about how changing their eating habits can make a huge difference for animals, the earth, and themselves. Join us in protesting Ribnick Fur and Leather, 224 N 1st Street in Minneapolis, on Fur Free Friday, November 23 from 11am to 1pm. If you agree that the fur industry is cruel and unnecessary, we want you there! New this year will be anti-fur caroling, with a short, on-the-street rehearsal for those who want to sing during the event. Lyrics will be provided on site, so come ready to sing. You can make a personalized sign if you’d like, but we’ll also have signs and literature available, so feel free to just show up. If you’re still wearing fur coats and fur-lined hats and gloves, did you know that through our Cuddle Coats program those fashion faux pas can be donated to ARC for a tax deduction? 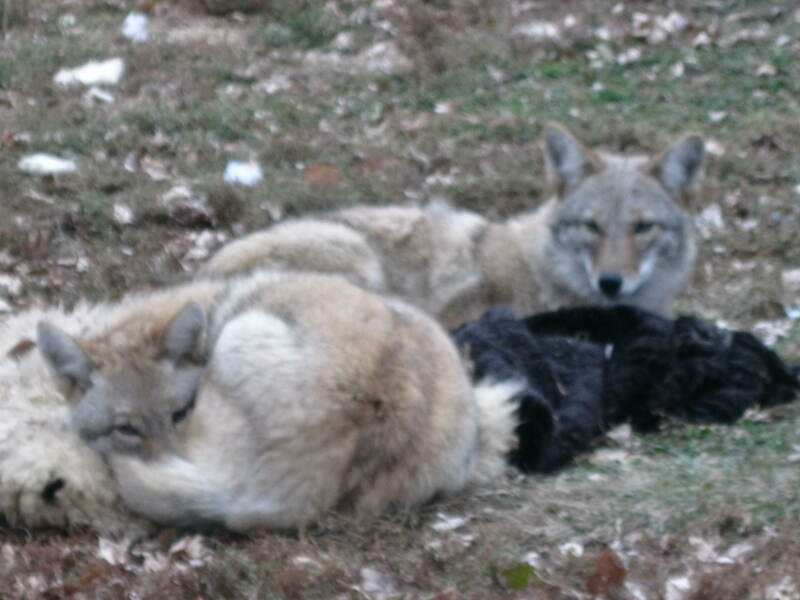 Donated furs offer comfort to orphaned, injured, and abused wild animals and aid them in their recovery at our 14 partner wildlife rehabilitation organizations. Over 150 people attended the 19th Annual Healthy Harvest Turkey-free Thanksgiving Potluck and Silent Auction sponsored by ARC, EarthSave Twin Cities, and the Alliance for Sustainability on Sunday, November 18 at Lake Harriet United Methodist Church in Minneapolis. The buffet tables were overflowing with delicious, cruelty-free dishes and we almost ran out of tables. We were thrilled to see so many new faces! 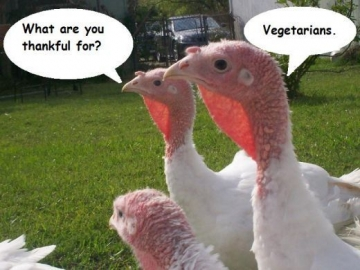 For other Thanksgiving events you may be attending, check out Episode 2, the Thanksgiving episode of Rhymes With Vegan for recipe ideas. 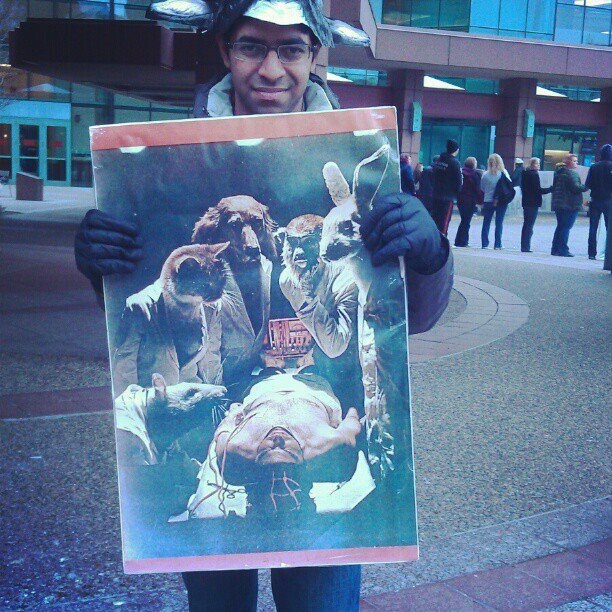 Thank you everyone who participated in the STOP AALAS Protest on Sunday, November 4 at the Minneapolis Convention Center. We had an amazing turnout of about 100 people and we made the news! Kim Socha, Jenna Cameron, Ali Lillehei, and many others, thanks for helping organize. This year, the American Association for Laboratory Animal Sciences (AALAS) is holding their annual convention at the Minneapolis Convention Center from November 4-8. This is the largest animal research organization in the country and the largest animal research convention in North America. It isn’t every day that this many animal tormentors all congregate in one place, and right in our back yard, so thanks to those who came out to represent compassion in the face of institutionalized animal cruelty. 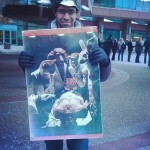 The peaceful protest included a post-Halloween costume component to represent the many nonhuman animals who have died in experiments: mice, pigs, primates, dogs, cats, and other animals. Thanks to Tao Natural Foods and everyone who came out to support their fundraiser for the Animal Rights Coalition on Thursday, November 1. Tao is donating 10% of all vegan sales from the day, including both the restaurant and the wellness store, to ARC’s animal advocacy programs. 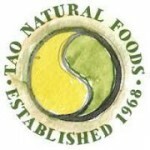 Please continue to visit Tao Natural Foods to enjoy their delicious, 100% organic, healthy, vegan cuisine. Congratulations to this year’s Vegan Iron Chef winner, Kaylyn Knopp and the other contestants: AmyLeo Barankovich of Vegan Affairs, Megan Duke, Caitlin Rudeen of Caitlin’s Healthy Homemade, Rachel Smith, and Melissa Swanson who made the third annual Vegan Iron Chef competition on October 20th such a success. 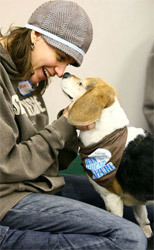 The event raised over $500 for ARC’s animal advocacy programs. Butler Soy Curls was the common ingredient for the recipe competition. Check out the winning Vegan Iron Chef 2012 Recipes. Want some soy curls after reading all the yummy recipes? Just stop by Ethique Nouveau, 317 W 48th St. in Minneapolis.